Are Credit Unions a Rebel Alliance? If you know me at all, you know I am a self-proclaimed Star Wars geek. I’m totally cool with it. 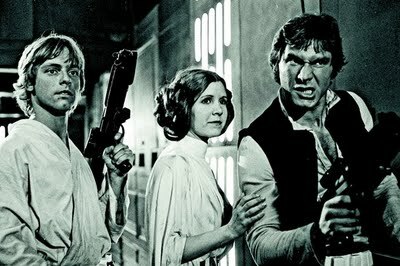 I love Star Wars because it was revolutionary, also because I am a geek, remember? Other than the pure entertainment value of the series, I think there are some correlations to the credit union industry. I also believe that all of us can learn a few lessons from Luke, Leia, Yoda (of course) and even the ewoks. If you haven’t watched Star Wars, stop reading now. You will not enjoy this post and you will probably miscategorize me as a nerd. Geek > Nerd. The Cooperative Network is one of our biggest assets. Our capitalization here is a must. Continually talking about the level of service we provide is a waste of time. Member service should be at the center of our daily operations and engrained in our organizations, it is not a marketing or branding tactic. Talking about outstanding member service at length is equivalent to an elaborate touchdown dance. Act like you’ve been in the end zone before. Instead, I propose we focus our messaging on Shared Branching. Not every credit union has it and in my opinion that is a shame, but it’s what makes us relevant outside of our own respective fields of membership. Even more disappointing to me are CU’s who refuse to embrace the concepts of collaboration and cooperation. I’m going to go out on a limb here and say that it is a fact that credit unions often lose members upon two specific life events: relocation for education or employment (there are others, but many of our members will approach one of these markers.) This is important because if a member is heading off to college or starting their first job after university, they will need to borrow money soon. We need loans and they need protection against higher rates and hidden fees. It’s a win win. Pick the right Master and be a good Apprentice. You don’t have to look any further than The Credit Union Times to know that there are some fantastic up and comers in our industry. What CU Times has down with their Trailblazer 40 & Below program is completely rad. Why is it so rad? Well, it shows that there are a lot of young people with different ideas and experiences that are doing awesome things to move the industry forward. Just like Star Wars, we must remember is behind every Apprentice there is a Master (mentor). There is no doubt in my mind that the only way to make yourself a better CU professional and better person is to find the right mentor. For me it was Kevin Ralofsky. All I am saying here is regardless of our age, position or status, we all need a mentor. The mentor relationship is not a one-way street, each person benefits from sharing thoughts, ideas and information. There are a lot of differing opinions about marketing, branding, strategy and much more floating around in CU Land, but the only way to sift through them all and come up with a plan and direction that is right for your credit union is to collaborate within your own CU’s walls. If we can not do this effectively, how can we expect to collaborate on a larger scale? There have been a number of great blogs about small credit unions and their flexibility. I do not wish to take up your time and hammer this issue home anymore. Frankly, I don’t think I could put it any better than how James Robert Lay puts it here. What I do wish to pass on to you is the importance of leveraging unique opportunities. We’ve all heard that we only get so many chances to do something awesome. Most of the time this is said about personal opportunities. I think the same holds true for businesses (credit unions). Many credit unions are creatures of habit. They do the things they do to brand, market and sell loans because “That’s how we’ve always done it.” Well I’ve got news for you, people used to send mail by horse… The bottom line is this: Many of the biggest advances known to man started off as “off the wall” ideas that someone had enough guts to undertake. If you want a Star Wars reference, think Ewoks on the Moon of Endor. We don’t have to do things the way they’ve always been done. In fact, if we do not continue to innovate, collaborate and cooperate, we stand no chance at all. We need to nurture and develop unique ideas. Sure, trying something completely foreign is a scary thing to do, but settling for less than stellar strategy is even scarier to me. What other lessons from Star Wars can you think of? I absolutely LOVE the Star Wars reference! In fact, as I write this comment I’m wearing my Darth Vader “Who’s Your Daddy” t-shirt! Another similarity I see regarding Star Wars and credit unions is that we must “use the force.” So what’s our force? I think it is our members. There is true power in credit unions using member stories and leveraging word of mouth marketing. We may not have the big marketing budgets but we do have our members. Le’ts use them (or “use the force”). As always, you are right on. Telling our member’s stories in unique ways is imperative. We need to find ways to get our member’s stories out to the general public in order to raise awareness about what credit unions are all about. We cannot remain a “best kept secret”. Strategy and marketing differentiation is key in my humble opinion.